Haystacks is famously Wainwright's favourite fell, and I must admit it is also one of mine. Although it isn't one of the higher fells - indeed it almost feels like the summit must have been cut off - the summit area is a lovely area to explore, with far more variety in a small area than on most of the tops. Like most of the fells on the ridge between Ennerdale and Buttermere Haystacks has two very different faces. On the Ennerdale side it forms part of the long, straight, steep northern wall of the valley, although unlike the fells to its west there are paths on this flank - two that reach Scarth Gap and one following Loft Beck. The Buttermere side of the fell is lined with crags, part of the longer line of crags that loom above Warnscale Bottom. These crags give the fell a distinctive 'crinkled' appearance when seen from Buttermere, with Big Stack a prominent feature. Because of its low height the views from Haystacks aren't extensive, but you do get detailed close-up views of some of the best fells in the district. Pillar is seen to good effect across Ennerdale, as is Great Gable at the head of the valley. The Buttermere view is also impressive, with a great view of the fells across the lake..
Buttermere can be approached from three starting points - Ennerdale, Buttermere and Honister Pass. The summit area itself is accessible from both ends. At the Scarth Gap end there is a single path that clambers up the steep western slope and includes some easy scrambling on rock before reaching the main summit. The eastern end is more open. The main path runs above the crags, passing to the north of Blackbeck Tarn, but the area south of Blackbeck Tarn is perfectly passable. The main barrier to the walker in Ennerdale is distance - if you aren't stopping at Black Sail Hut then Haystacks is a very long walk. If you are then the fell can be approached up the Scarth Gap pass or up the Loft Beck path. From Buttermere there are three options - Scarth Gap via the path that cuts across the base of High Crag or the Blackbeck Tarn route, taking either the well graded path that runs up the side of Fleetwith Path or the harder path that runs between Black Beck and Warnscale Beck. There is only route from Honister Pass. This climbs up past the slate mine and crosses Fleetwith (either on the quarry track or the abandoned tramway, which is now a rather nice path). 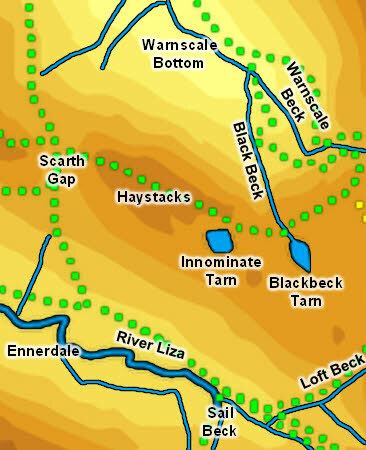 This brings us to the top of Warnscale Beck, where the paths split - take the left-hand branch, which drops down to cross the beck, then climbs past Little Round How and runs along the top of the crags to reach Blackbeck Tarn and beyond that Haystacks. This is one of the easiest routes onto a classic summit, but does involved rather more effort that one might imagine from a casual glance at the map - between Fleetwith and the summit the path crosses four becks, each with a drop and a climb, and each needing to be passed once on the way and once on the way back. Three of our walks visit Haystacks. We have an ascent of Haystacks from Honister Pass, an ascent of Haystacks from Buttermere and an enlarged version of the same walk that continues on to Brandreth. Technically the summit of Haystacks is a rocky ridge at the western end of the fell, reached fairly quickly from Scarth Gap. This is indeed the highest part of the fell, and is a lovely place in its own right, with a small summit tarn and great views into Buttermere and across the head of Ennerdale. For most people the summit area includes the entire plateau stretching east from the highest point, past Innominate Tarn and only really ending at the start of the drop down to Blackbeck Tarn. This whole area is a delight - an undulating upland dotted with tarns and with hidden corners to explore. It can be crossed along the busy main path but is better explored at leisure. Beware the line of crags just below the northern edge of the plateau. The Ennerdale side is less dramatic, but almost as steep, dropping down 800ft in one uninterrupted slope to Black Sail Hut. On the Ennerdale side Haystacks has clear borders. The River Liza runs along its southern foot. Loft Beck forms the eastern boundary and Scarth Beck the western boundary. A number of nameless streams flow off the southern slopes into the Liza. On the Buttermere side Warnscale Beck flows across the northern foot of the fell. Black Beck, running out of Blackbeck Tarn forms the eastern boundary and a nameless beck that flows from just below Scarth Gap into Warnscale Beck is the western boundary. The only other becks on this flank are to be found on the lower slopes. The top of Haystacks is dotted with small tarns, including one almost at the summit, but it is most famous for Innominate Tarn, in the middle of the summit plateau, a real gem of a tarn in a splendid setting. The fell also claims part of Blackbeck Tarn, which forms the boundary between Haystacks and Brandreth and is a popular camping site.